Meegan Domangue, PA-C graduated from LSU Health Sciences Center in Shreveport, LA with a Bachelor of Science Degree in Physician Assistant Studies in 2003. Prior to Physician Assistant school, she graduated from McNeese State University in Lake Charles, LA with a Bachelor of Science Degree in Biology in 1998. Meegan is a member of the American Academy of Physician Assistants, Louisiana Academy of Physician Assistants, and the Baton Rouge Physician Assistant Society. She is certified by the National Commission of Certification of Physician Assistants. 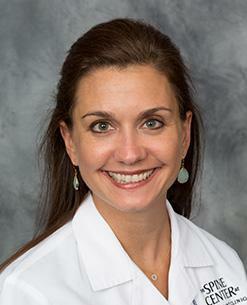 Meegan has background experience in general neurology and urgent care. She currently works part time in the Spine Center under the supervision of Dr. Kevin P. McCarthy and Dr. C. Chambliss Harrod. What Can I Do to Prevent Back Problems? Inversion Tables... Good or Bad?